Directed by Bob Hercules and Rita Coburn Whack. USA. 2016. 114 min. 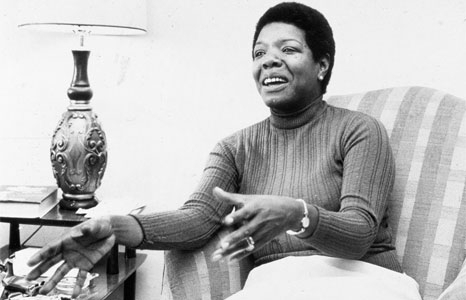 This film—the first to be made about the incomparable Maya Angelou—is an intimate, moving tribute. Referred to as “a redwood tree, with deep roots in American culture,” Angelou gave people the freedom to think about their history in a way they never had before. She was a singer, dancer, activist, poet, and writer who inspired generations with lyrical modern African-American thought that pushed boundaries. This unprecedented film weaves her words with rare archival photographs and videos, which paint hidden moments of her exuberant life during some of America’s most defining moments. From her upbringing in the Depression-era South to her work with Malcolm X in Ghana to her inaugural poem for President Bill Clinton, the film depicts the life of an American icon. Friends and family interviewed in the film include President Bill Clinton, Oprah Winfrey, Common, Alfre Woodard, Cicely Tyson, Quincy Jones, Secretary of State Hillary Clinton, John Singleton and Dr. Angelou’s son, Guy Johnson. Enjoy good music, good wine, good food and good company and the exhibition Karen Hampton: The Journey North before seeing the documentary Maya Angelou: And Still I Rise. At 6:30pm and 7pm, take a gallery tour and see youth poets perform spoken word pieces written in response to Karen Hampton’s work. The film screens at 7:30pm. Sunday, Feb 5 at 4pm: Dr. Kathryn Waddell Takara will perform a poem writen for Dr. Angelou prior to the screening of the film. American Book Award winning author, Kathryn Waddell Takara, PhD, was also the recipient of the 2016 lifetime Achievement Award presented by the Honolulu NAACP as an “Agent of Change”. She coordinated several seminal national conferences on African Americans during her 30 years as a professor at the University of Hawaii. In 2008, she began her second career as a publisher and editor in her company Pacific Raven Press, LLC. Takara is widely respected and admired as a public scholar, lecturer, and performer of her poetry.